Here is the latest music video from Mizzouri Foxx – Born For You. This is a love song written by guitarist Gary Lohmann, simple yet filled with emotion. This song is one of many great songs from the What If? album . New CD released by Mizzouri Foxx – What If – This is the latest music released by the band. The album contains a collection of new songs written and performed with the same Mizzouri Foxx style that you expect. Band members Gary Lohmann and Kenny Vaughn say “If you still love good ole 70’s rock n roll music, then this CD is for you”. Come and discover our new songs like “You’re The One I Want, Born For You, Above The Legal Limit, Crossroad” and many more. This is a culmination of creativity that was just fun to write and record for our fans. These songs were written with the intent of exposing situations that we have all experienced in our lives. So crank up the tunes and enjoy our latest venture. Rock On! Everyone is invited to our initial “What If” album Release Party at Sam’s Cellar in downtown Neosho, Missouri on Saturday night starting around 8:30. We will be playing the new CD at least twice and enjoying food, drink and visiting with friends until late in to the night!! Hosted by Gary Lohmann and Kenny Vaughn. CD’s will be available for purchase at this party! Rock On! The front of the Album/ CD jacket has been completed and the final tracks have been recorded. Our current target release date now is sometime in May. Thank you for your patience!! New Song Release – Dracula’s Bride is Here! It’s that time of year when spooky goblins and scary vampires lurk in the shadows. Here it is, Dracula’s Bride written and performed by the band. A great song to add to your Halloween collection of music. Please click on the sample to listen a bit and if interested, download from PayPal. Both the sample and song are MP3 quality. Anyone who is having a Halloween Party this year will want to play this song and perhaps have a Dracula’s Bride costume contest!! Flash plug-in is required to see and play the sample from your PC. This is a standard plugin used to watch video’s. Sorry, your Apple iPad or iPhone will probably not play this. New Release – “Born For You” is here! Hope you’re ready, introducing a new song – “Born For You”. This love song is written for that special someone who you can’t live without that makes your heart melt. “Born For You” just might extend that love right through the night. 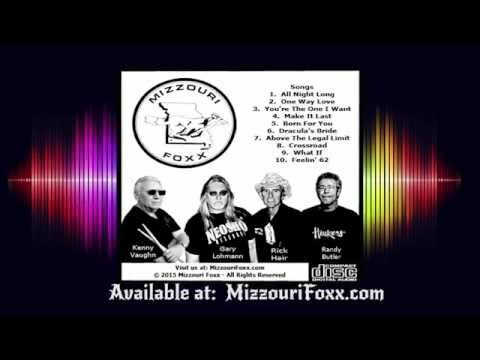 Come along and enjoy this wonderful new song recorded by Mizzouri Foxx. As of August 3, 2014 – Dracula’s Bride Has Been Created! Keep checking this site for more details and tell everyone you know to beware!! The Bride Lives! * * * Know anyone who is having a wedding? Or who has recently fallen in love? Then buy them “Born For You” so they can share it with the new love of their life. This is a NEW classic 70’s rock ballad that will create timeless memories for lovers new and old!! Enjoy! Life is simply too short not to….. The Resurrection of Dracula’s Bride is still evolving……. Please check back to this site as two singles will soon be available for Ipod downloads. We will also be taking advanced orders for the new CD which we project will be ready by this November!! Rumor has it that Gary, Kenny,Randy and Rick are working on a new CD which would be a collection of old and new original songs! Stay tuned for updates on this. “What If” the rumors are true!! The guys were in Neosho working on some stuff the first week in November, yet to be announced. Stay tuned! !